I get in my feelings sometimes. I want more. I want to see more. I want to give more. I want to have more. In my family, we were raised to be humble. This can get wrapped up with thinking you don’t deserve or shouldn’t have, I think. Not that there’s anything wrong with being humble. Humility has its value and its place. But it also gets confusing. This sentiment piece isn’t about waking up in the morning. It isn’t about early birds. But it’s also open to interpretation- the more that I’ve been embracing my own goals, ambitions and dreams, the more I see myself waking up early with a smile plastered on my face. Let me be a cheese burger here. Thanks to you, I have started turning into one of those people who throws back the covers and leaps out of bed in the morning. I want to make sure that on top of whatever else I do that day, I squeeze in some time dedicated to my Silhouette friends. 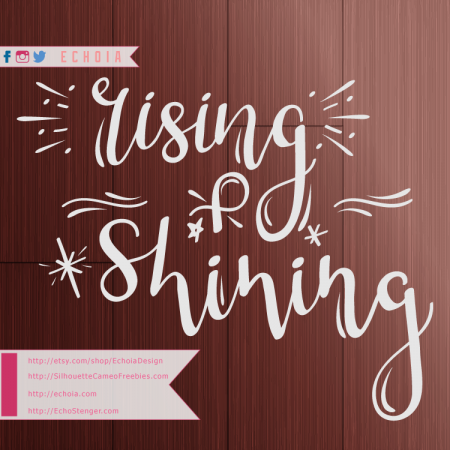 If you’re using this design to make things for yourself, or personal gifts for the ones who help you rise and shine, all you need is the free file linked below. If you’ll be selling, promoting your business or otherwise profiting from my work, you will need to license my design at EchoiaDesign on Etsy.